The distinction of being the first R.A.F. unit to operate from French mainland soil since the Fall of France in 1940 went to Johnnie Johnson's 144 Canadian Wing. On June 10th, 1944. It was a milestone in the hard-fought air war against the Luftwaffe which had commenced with the air battles over France a long four years before. Constructed in three days by R.A.F. servicing Commandos, the first temporary airstrip in Normandy received its Mark IX Spitfires on D-Day-plus-four marking the beginning of R.A.F. Fighter Command's aggressive thrust through.<. France and across the Rhine to final victory. 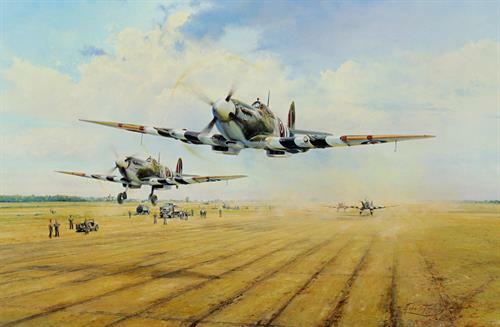 Robert Taylor's specially commissioned painting captures the historic take-off from St. Croix, as Johnnie Johnson leads his Canadians off the hastily constructed strip for the first combat sweep emanating from French soil since the R.A.F. 's abrupt departure from France almost exactly four years earlier. AIR VICE MARSHAL J.E. 'JOHNNIE' JOHNSON DSO and 2 Bars, DFC and Bar, Legion D'Honor, D.L.